The Orb of Agamotto is Doctor Strange's powerful magical relics. 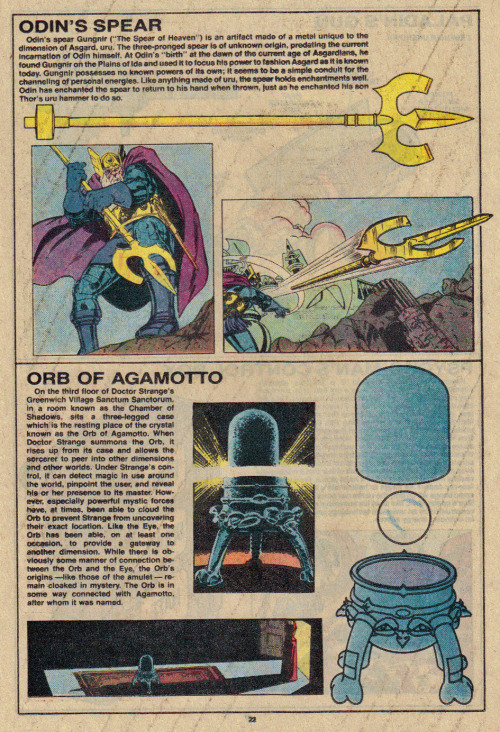 Like many of his relics they originate from the mystical entity Agamotto of the Vishanti who provided the relics to original Sorceror Supreme. The orb is stored in the third floor of Doctor Strange's home the Sanctum Sanctorum. The orb has its own room called the Chamber of Shadow. The fact that Orb is given its own room shows its considerable importance to the Sorcerer. Detect Magic usage- Peering into the orb the user can pinpoint where magic usage is occurring, the type of magic and who is using it. Peer into any place - The Orb allows the user to appear into effectively any location including other dimensions. Portal creation - On occasion the Orb has created a portal to another dimension. Connection to the Eye of Agamotto - There is a magical connection between the eye and orb of Agamotto that allows one to find the other. The exact nature of this connection is shrouded in mystery.